Former recipients Eric Lindros (1994-95) and Daniel Sedin (2010-11) presented the TLA to McDavid during the NHL Awards in Las Vegas. McDavid played in all 82 regular-season games for the Edmonton Oilers, for the second straight season. The Oilers’ captain led the league in points (108) to win his second consecutive Art Ross Trophy, while recording the third-most assists (67), scoring the sixth-most goals (41) and placing first in points per game (1.32). McDavid led the NHL in multi-point games (32), as well as even-strength goals (35), assists (49) and points (84) – finishing with 18 points more than the second-ranked player in the latter category. Among league forwards, he finished fourth in average ice-time per game (21:33). Last season, the 21-year-old became the third Oilers player (Wayne Gretzky, Mark Messier) to be named the most outstanding player by his peers. He is also the first back-to-back recipient of the TLA since Sidney Crosby (2012-13, 2013-14). 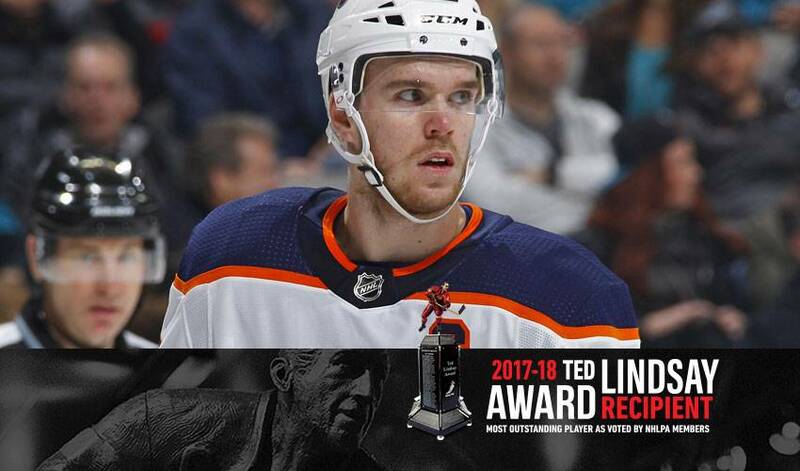 The Ted Lindsay Award (TLA) is unique as the only award voted on by the players themselves, carrying on the tradition established by the Lester B. Pearson Award in 1970-71. Reintroduced in 2009-10, the TLA honours Ted Lindsay – its namesake – an NHL All-Star forward known for his skill, tenacity, leadership, and role in establishing the original Players’ Association. Annually, NHLPA members vote on the player they deem to be the most outstanding in the NHL regular season. For more information on the TLA, visit NHLPA.com. Join the conversation by using #TedLindsayAward.